Sir Michael Costa (1808-1884), pioneering conductor and orchestral reformer, was commemorated today with an English Heritage Blue Plaque at 59 Eccleston Square, London. 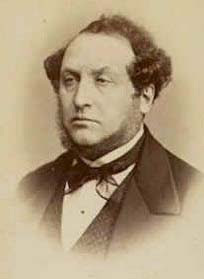 Costa was the dominant figure in England's musical advancement during the mid-nineteenth century and it was during his career that England largely shed the reputation of being a "land without music." 59 Eccleston Square is a particularly significant address because it was here, between 1857 and 1883, that Costa spent half of his 55-year career in London. He entertained some illustrious guests at the house, including the Anglo-Italian opera singer Adelina Patti; the leading music critics, for whom he gave an annual dinner; and the Prince of Wales, who called on Costa several times when he was ill in the 1880s. Costa organized most of the Royal Family's private concerts at Buckingham Palace and Windsor Castle and was regularly invited to sing and play with Queen Victoria. His preeminence as the first professional conductor in England was recognized in 1869 when he became the first person to be knighted for his services as a conductor. Maestro Antonio Pappano, music director of the Royal Opera, unveiled the plaque.